My favorite Zelda game is Ocarina of Time. Search the Legend Of Zelda On google molly. I think they should redo the graphics and physics of ocarina of time. The map in ocarina is the best. You no how link gets transformed into a kid again, and the adult stuff never happens? I think twilight princess is 7 years later when he is that old. But, Hey. I only beat ocarina of time like 3 times.. I never beat the water dungeon because I tryed skipping past the fire dungeon. Then I was like stuck forever. 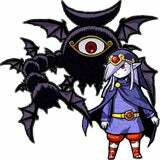 Minish Cap was kinda cool, and Four Swords Adventure. I heard they are releasing two games of Zelda, Spirit Track and an unnamed one. Spirit tracks you get a train instead of a boat. and instead of a clawshot/hookshot you get a whip. The un-named one, is.. unknown. Ocarina is still teh best. And it always will be. Ocarina of time in 2D xD. Lol I have Haxxed minish cap on my ipod touch. Subject: Re: What Is your favorite Zelda game?